This week, the placenta takes over the job of the yolk sac. 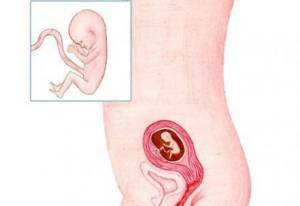 The placenta provides your baby with nutrition and oxygen. The things you eat and drink pass into your blood and then through your blood to the placenta and therefore to your baby. Your baby is and remains dependent on your healthy eating patterns. The growth spurt your baby was going through is not over yet! This past week, baby has grown about 0.59 inches and by now has reached 3.42 inches and weighs 1.52 ounces. Baby is focused on further developing, growing and strengthening their joints, muscles and kidneys. Baby also opens their mouth every so often and starts practicing swallowing. Baby doesn’t swallow properly yet, as they move their whole body and not just their mouth. You still can’t feel any of it, but it won’t be long before you can! Baby’s fingers and toes are also becoming more refined and are starting to look more like the fingers and toes of a newborn. Baby will soon start growing nails. It seems early but start thinking about all the things you will need for your baby after the birth: the layette set. If you do it now, you will have plenty of time to find lovely items and you can spread out the costs. If you want to renovate your home at all, it’s advisable to get on with it now. You are still mobile and can handle DIY. But, don’t tackle everything. And take care with painting and lifting. You are probably well aware that pregnant women can be very emotional. The hormones make you more sensitive. This week you will notice that your emotional reactions have intensified. All of sudden you are very happy, then sad and then crying buckets. And this often happens for no apparent reason. A comforting thought is that these intense emotional moods will soon pass. They are all part of the process.